Orchestra instruments available to 3rd graders are violin, viola and cello. 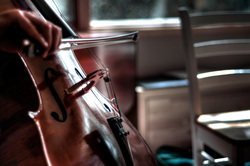 Mrs. Twigg will accept a student on string bass for 4th grade. Band instruments available to 4th graders are flute, clarinet, bass clarinet, alto saxophone, trumpet, trombone, euphonium and percussion. Mrs. Twigg will accept one student on tuba in 5th grade and consider starting a tuba in 4th. This year every 3rd & 4th grader will get a chance to try some instruments before determining what instrument they wish to play (or if they do not wish to join the program). Make sure to ENROLL (when you click on Student, you'll see a little "first time here?" and click the blue Enroll in your class link). The school code is RockburnMusic. The student ID is your child's school ID. (Which can be found on any old Howard County report card.) The next page asks you to write in your child's Activation Code which is found on the first page of their Essential Elements book. Students then need to create a user name & password. I recommend that they write this down in their book so that they do not forget it. (Keep it simple!) Students may then log into the EEi (essential elements interactive) site. They should click on the microphone icon (top right) to get to their music. If you click on "View Songlist" in the left menu, all their book exercises should appear. Please encourage your child to practice with the music. They may use the EEi site with any devise that allows them access to an internet browser such as Safari, Chrome, Firefox, etc.